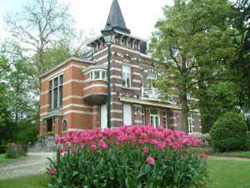 The Children’s Library is located on the first floor in the Crousse Community Centre in Woluwe Saint-Pierre in Brussels. By car – the Library is easily accessible by car (see map). Parking is not allowed on site, but there is usually parking space on the Rue au Bois, where there are two entrances to Parc Crousse, or in Clos des Chats, where there is also an entrance near the top of the street. By public transport – the Library is within walking distance of trams 39 (stops Rue au Bois or Musée du Tram) and 44 (stop Musée du Tram) and of bus 36 (stops Mareyde or Musée du Tram). On foot or by bicycle – the Library is located just off the foot/bicycle path that runs along the the old train track from Auderghem to Stockel. If coming from Auderghem, direction, turn right at the track’s intersection with the Rue au Bois. If coming from Stockel direction, turn left at the intersection. The entrance to Parc Crousse is on the corner of the next crossroads (Rue au Bois, Rue Konkel, Rue Kelle).